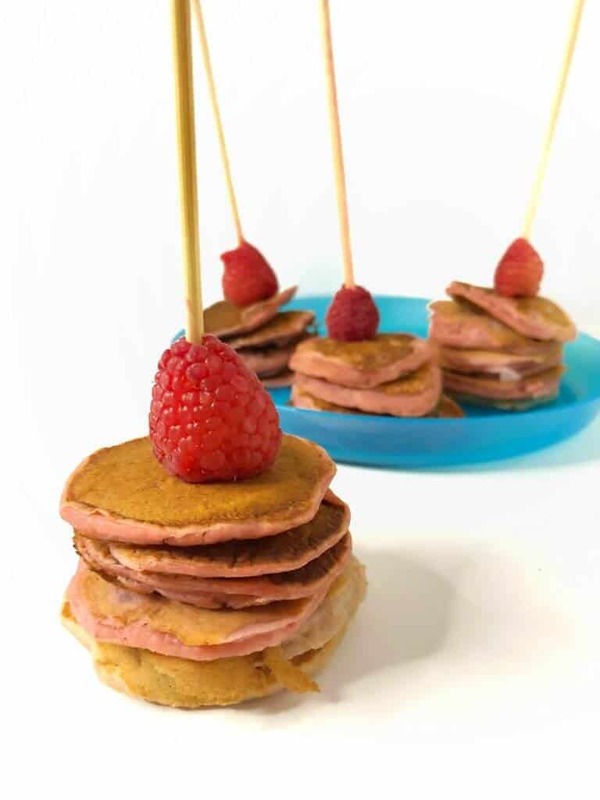 Mini makes everything more fun, so you know this pink raspberry pancake kabob recipe are going to be a hit with the kids! I’ve made pancake kabobs before but this time wanted to make something pink for my kid. You can make pink pancakes anytime you’re wanting to feel special, or just feeling in the mood for fruity delicious pancakes, but these are one of my specials for Valentine’s Day! *The following post may contain links to products that I may earn a small commission from at no extra cost to you. I was never a pink girl growing up. Purple? Sure! Pink was for girly girls to me. I was more of a Rainbow Bright with sunshine kind of kid. So when I had my daughter and she eventually went wild for pink I know my own mother was smirking a bit, just thinking about all the times I was not into pink as a kid! I’ve upped the game; I put them on a kabob stick. My eight-year-old self would have been delighted by that kabob stick. The stick isn’t necessary to enjoying pink pancakes, but it sure does up the fun factor! Slide a raspberry on top and you have pancakes worthy of Valentine’s Day! Pink hearts, love, raspberry pancakes… they all go together. Even better these pancakes slide easily into a lunchbox. They also freeze well too. I freeze them between wax paper sheets so I can slide out just a few at a time. Toast these raspberry pink pancakes in the toaster oven or microwave them for ten to fifteen seconds. You can also add protein powder to the recipe if you want to give them a boost. 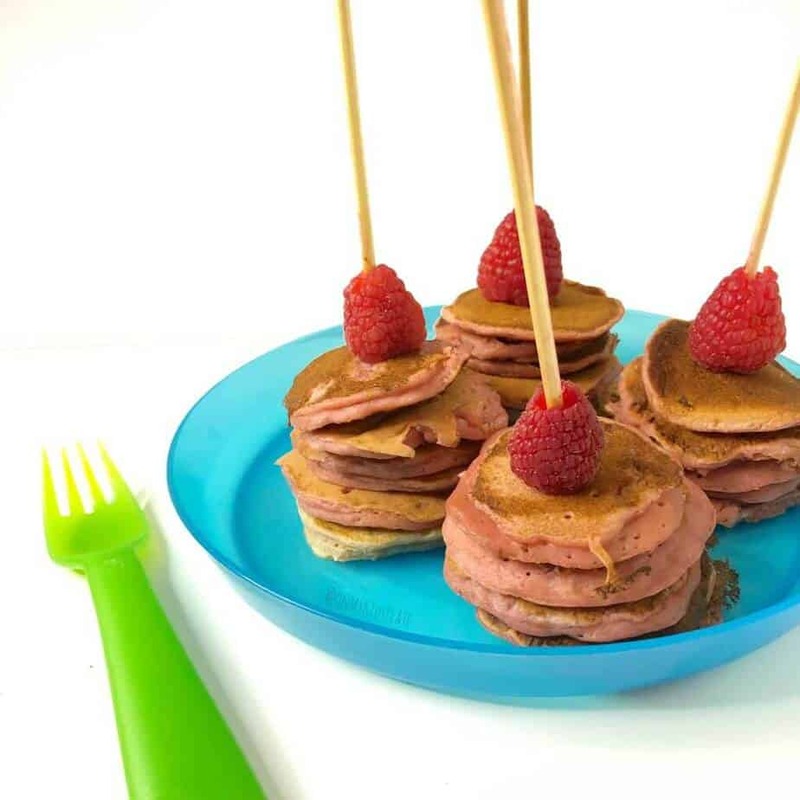 Recently, I wrote a sponsored a recipe post for Sneakz Organic featuring Neapolitan Pancakes that you can make using their fab protein powders designed to give kids an extra boost. While that post was sponsored, we keep using the powders in our house. I like how they are a clean product and are a great way to give a meal a little extra boost or protein every now and then. You could easily add Sneakz Organic protein powder in either vanilla or strawberry to this raspberry pancake recipe too, we do sometimes in our house. I just add one scoop to the recipe below, but it’s totally optional and I don’t do it every time. With a whisk, mix in coconut milk, honey, oil, egg and vanilla. Whisk well making sure all dry ingredients are combined well, plus a little more! Throw raspberries in a blender (frozen is fine) and blend until smooth. Add raspberries to pancake batter combined with one tablespoon of flour. Whisk together well. Batter will turn pink! If your batter is extremely liquidy add an additional tablespoon of flour and whisk in well. Using a tablespoon, spoon batter onto a frying pan set to medium to low heat in small circles. WIthin 10-20 seconds batter will begin to bubble, flip pancakes! Continue cooking pancakes in small batches, pancakes will cook quickly as they are mini sized! Break a standard kabob skewer in half. Thread mini pancakes onto the kabob. Top with a fresh raspberry. Eat and enjoy, or freeze for later! Adding flour to the end helps you thicken up the batter. Raspberries can vary on their liquid content, but for most batters between one and two tablespoons should thicken enough that your batter will not be runny. Batter should be liquidy enough that it moves when it hits the pan a little, but should not run across the whole pan. 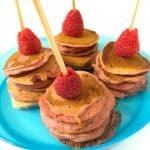 So how would your kid react to pink raspberry pancakes kabob recipe? Does your kid love food on a stick? Tell me your thoughts in the comments!